At Gotstyle, we believe that keeping a sleek tuxedo in your closet is one of the manliest things you can do. Here's why and what to look for. 1. YOU WILL NEED ONE, AT LEAST ONCE. A situation we see too often. Guys struggling to put together a last minute look for a "Black Tie" invite. Fellas, it pays off to be prepared. If you live in Toronto likely, you are going to a couple formal events a year like The Sick Kids Gala, Motion Ball, and Weddings. These events pop-up often and suit just won't command as much attention as a shiny new tuxedo. 2. IT FEELS GOOD TO LOOK GOOD. Tuxedos are classic menswear piece that can make any man look good. When you wear a sharp looking tuxedo; you stand taller, look leaner, appear to be more sophisticated and definitely confident. 3. WE'RE MORE CASUAL THAN EVER. Hey, you can be casual and dressed down all you want in your day to day world, but when there is a special occasion why not step up a notch (or five). There is nothing wrong with looking good and leveraging your own personal style to get noticed. Remember: It is even more important to have your tuxedo fit perfectly to avoid overly long tuxedo pants, bottom button blunders. (Sorry George) Hey, even celebrities (and their stylists) get it wrong! Here is what to look for. Nothing boring here! The typical tuxedo trend used to be a classic black look but in recent years, the tuxedo game has trended with colour and more creative looks. The most popular color? Midnight Navy or Electic Blue. Thank you, Ryan Gosling. No wonder women love this guy! Ryan's look was the inspiration behind Paul Austerberry's red carpet outfit that Gotstyle's Master Tailor Konstantine created. Paul wore this during his award run for Shape of Water. You'll notice that velvet tuxedo jacket's combine richness and formality. This blue velvet is lighter than navy, but not that too bright electric blue either - the perfect color to catch the light - especially when you’re walking on stage to receive your oscar. 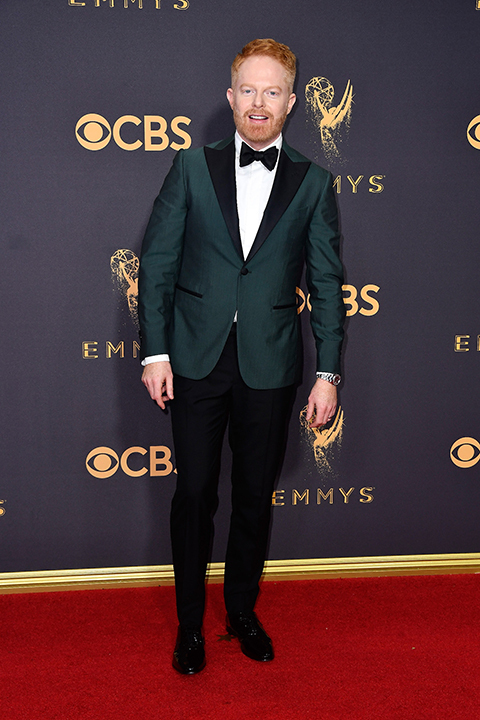 For some- the less anticipated, Emerald Green tuxedo, makes an even bigger statement. And seriously pops if you're rocking a red 'do. Another recreation of our in house custom team. A custom green tuxedo for Drew Scott of Property Brothers. Drew Scott chose a mohair fabric. Mohair adds extra sheen making the piece seem more formal. Milo Ventimiglia, 2018 Critics Choice Awards. Yes, we understand that the cast of stranger things have more swag than 90% of the population. But we can help get you there! Call Konstantine to start dressing sharper in 2019. Go green, or go brown, but don't settle for boring black! Call Konstantine for a tuxedo that could walk the red carpet. Make an appointment for your own inspired custom tuxedo at our tuxedo event from February 8th to 12th.